What are the Advantages of a Crawl Space Dehumidifier? A crawl space is the wettest part of any home, and the coldest. Portable units are not designed to cope with these conditions. The best model for the job is a unit designed and built for it. We'll take a look at the reasons why this is so and I will suggest five crawl space dehumidifiers that will fit the bill. The description of each model is brief but, by following the links, you can take a look at our detailed reviews of each unit and make up your own mind which is the best one for your home, a purpose built model or a portable. First I will talk about how a crawl space dehumidifier is very different from a portable; then we'll look at why a crawl space is so wet and touch on the basic steps to minimise damp penetration; finally, I'll explain how a crawl space unit can help and offer some tips on what to look for if you are buying one. 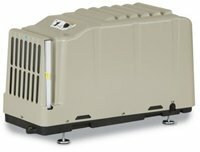 A crawl space dehumidifier is designed and built to be ideally suited to one particular operating environment, a crawl space. These spaces are cramped, with limited headroom, so a crawl space dehumidifier is low in height to fit more easily into one. Portables are taller, with a smaller foot-print, to fit more easily into the living areas of our home. A crawl space is a hostile environment, both cold and wet. A crawl space dehumidifier is as tough as the environment it is designed for. It has a steel casing, rather than the moulded plastic of a portable unit so outside it is more robust and durable. Inside it has high quality, heavier and more efficient components. The fan, for example, looks as though it could pull a plane across the Atlantic, unlike the "children's windmill" versions seen in portable units. If you were to remove the casing you would see expensive materials such as brass and stainless steel which are evidence of the commercial standards to which these units are built. The components are built to last but, and equally important, they enable the appliance to perform effectively at low temperatures. A portable will struggle to do its job at temperatures below 65°F/18°C whereas a crawl space dehumidifier is capable of working in much cooler conditions and will be several times more effective than a portable unit. The vastly greater effectiveness of a crawl space model makes it much more energy efficient in the conditions found in many crawl spaces. It does not need to run all the time to maintain a level of 45% to 50% relative humidity and this further extends its working life time. The bad news is that all this quality comes with a price tag around the $1000 mark. The good news is that the greater energy efficiency makes the life time cost of a crawl space dehumidifier less than that of the two or three portables that have burned out while running 24/7 to keep your crawl space, and your entire home, dry and mold free during the life time of a single crawl space unit. This is why for any crawl space where the temperature is below 65°F for part or all of the year a crawl space dehumidifier is the best choice for the job. Why is a Crawl Space So Wet? A crawl space is a type of basement but, as its name suggests, has only enough height above the ground to allow a person to crawl in. The lower surface, the "floor", is often soil. Opinions vary on their value but the advantages claimed for it include keeping the fabric of the main structure of the house above the ground to reduce the damage from ground and rain water and provide a barrier against infestation, by insects, particularly termites, and rodents. A second, less controversial advantage is the access it provides to electrical, heating, air-conditioning and plumbing components which require maintenance, repair or replacement. Such tasks could be much more difficult, and expensive, without it. A third benefit is the extra storage space that it can provide and many householders use it for this purpose. Access to this area is either through a hinged "trap-door" in the floor above, or through small doors in the side wall. The crawl space is a water trap and water can get inside from any direction, below, the sides and above. Because the floor is (usually) soil ground water can evaporate into the air directly from it. The soil is also a source of fungal and mold spores which grow and multiply in damp conditions. When conditions around the house are wet the water can penetrate the porous concrete and, when relative humidity is generally high outside, the ventilation outlets allow water vapor into the space. If the crawl space is cooler than the general air temperature this can lead to condensation. The air flow is also a potential source of fungal and mold spores. Any liquid moisture from the house above will tend to seep downwards, due to gravity. Water from above may be the least of the three problems as any water vapor, at least, will tend to flow upwards with the warm air due to convection. Why is a Wet Crawl Space a Problem? If it becomes too wet mold, mildew and other fungi will start to grow on almost any exposed surface. The mold, not to mention the water itself, can damage items stored there unless they are placed in completely watertight and airtight containers. Even more seriously the water, followed by the mold are two parts of a cycle. Insects thrive by eating the mold, the insects are a food source for vermin which are now more likely to appear. Certain species of insect can attack wooden parts of the house structure and if the vermin populations outgrow the supply of insects they may move into the house in search of food. If the space contains millions of fungal and mold spores, not to mention faecal material from insects, such as dust mites and other nasties, will any of this stuff get into the house? The simple answer is yes. As air is warmed it rises. The warmth may come from the heating system or simply the effect of the sun during daylight hours. The warm air is replaced by cold air, some of it from the crawl space. Since the warm air escapes through the upper levels of the house the cycle is continuous which generates a constant flow of air from the crawl space, into the house and through the house. This is known as the "stack effect". Naturally this is detrimental to health and comfort, particularly for those with existing medical problems, especially respiratory disorders and allergies. These problems are well known and, of course, building codes provide for certain standards designed to keep crawl spaces as dry as possible. But, and there are three buts here, building codes are not the same in all areas and change over the years; a provision for damp prevention may have been made in your home but may have deteriorated with age; your home may have been built before the measures now required became compulsory. So, step one, check what was done and check it is still working before taking any further action. Step two, deal with any outside sources of water. Make sure drainage around the foundations is sufficient and working as it should. Check that your gutters and downspouts are sound and that no water is flowing down wall surfaces. Look for evidence of water leaking in through walls, windows etc. and patch or seal as necessary. Step three, stop humidity rising from the soil floor by putting a plastic vapor barrier across all of the floor area. It is advisable to use a heavy duty crawl space liner of at least 15 millimetres. Remember, this is a crawl space. If you or anyone else has to crawl on it you risk tearing the barrier if it is not strong enough. The barrier comes in rolls and should be laid across in single, unbroken strips from wall to wall, overlapped and the overlaps sealed with tape. The edges of the floor barrier should also be sealed to the vapor barrier protecting the walls. Step four...? This is more a stop and think rather than a straightforward step. We mentioned above that humidity can enter the space through the ventilation outlets. So it can if relative humidity on the inside of the vent is less than it is outside. It works a bit like air or water pressure, it equalises to the level around it unless it's sealed off. But hey, wait a minute! Building codes, all the ones I've ever heard of, make ventilation outlets compulsory on newly built crawl spaces, don't they? Yes, they do. The received wisdom is that ventilation helps reduce damp. There is, however, something of a debate going on about this with researchers reporting that vents make damp worse. I am not going to join the debate but everyone should be aware of it and make up their own minds about whether to seal or not to seal. Neither a crawl space dehumidifier nor a portable home dehumidifier, will be effective if the vents are not sealed. One word of warning here, if you have a space heater, gas water heater or any other combustion device in your crawl space please ensure you have an adequate direct air supply to the appliance before sealing the vents, and that you install a carbon monoxide detector for added safety and peace of mind. Step five, if the first three, or four, steps have not completely solved your problems invest in a crawl space dehumidifier. How will a Crawl Space Dehumidifier Help? 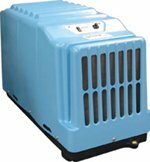 Many experts recommend a crawl space dehumidifier, why? Simply because it is the most cost effective way to control humidity in the wettest part of a house. If you have attended to the external sources of water penetration the main task is to prevent relative humidity from rising above the point at which mold and fungi will grow. That level is around 60% RH but we recommend a maximum of 50% for the minimum margin of safety and, ideally, 45%. This is because your dehumidifier should be placed in the center of your crawl space for maximum effect but the relative humidity will be somewhat higher close to the walls, because they will be colder than the general air temperature and will cool the air in immediate contact with them. Since your appliance will be regulated by a humidistat, about which more in a moment, the setting you choose must take account of these variations. A level of 50% or lower is also needed to prevent dust mites from flourishing so 45% is the best setting to choose. A suitably sized crawl space unit will have no difficulty maintaining a level of 45% relative humidity. Please note that the job of these appliances is to regulate the humidity to prevent a build up of moisture from condensation. It will not cope alone with severe water penetration, by which I mean that which results in pools of water on the floor, or worse. If a suitably sized crawl space dehumidifier is not keeping relative humidity within acceptable limits you almost certainly have a problem with the structure that requires attention. This is very much about the right tool for the job. In a finished basement, where you may spend significant parts of your day and treat like an extension to the house, a portable unit is usually adequate. In a cooler crawl space only a unit, designed and built for the task, will be good enough. Remember, a crawl space unit has a high water removal capacity, robust construction, is designed to cope with low temperatures, is compact and low in height so that it can fit into the most cramped of spaces, and is energy efficient. Since you will probably not be enthusiastic about making several trips a day to empty the water collection bucket a continuous drainage facility is essential. Models for crawl spaces do not always have a built in condensate pump so if gravity fed drainage is not practical you will need to purchase a separate condensate pump. As with all these appliances we recommend that a crawl space unit should have a humidistat. A humidistat works like a thermostat but switches the machine on or off in response to a pre-set level of relative humidity rather than temperature. This prevents wasting money running the machine when the relative humidity is at a safe level. Automatic restart, which switches the machine on and restores your chosen settings following a power outage, is also desirable and, for the less agile, essential in such a cramped area. These are features you may wish to look for in any crawl space dehumidifier. Beyond that ensure that the machine you choose has a water extraction capacity which is able to cope with the area and volume of your crawl space. Manufacturers specify the areas in which each model will be effective but two words of caution. First, water extraction rates are often calculated in "ideal" conditions of temperature and humidity. That is to say ideal conditions for the appliance! Extraction rates in "real world" conditions may be much less so we always recommend you buy "one size bigger" than you apparently need, particularly if the area of the space is close to the upper limit quoted for a given machine. Second, it would be difficult to imagine less "ideal" conditions than those you would expect to find in a crawl space. It is sensible to allow a wider margin of safety when choosing your model. The Aprilaire 1710 is a high capacity unit designed for energy efficient and effective operation in areas of up to 2,000 sq ft (manufacturer's figure). It has been awarded consistently high ratings in reviews by consumers and is one of the best crawl space dehumidifiers available in the market. The SaniDry CSB is a large capacity unit exactly tailored to the conditions found in the typical crawl space. It has a water extraction rate of 90 pints per day and is rated by the supplier as suitable for an area of up to 2200 sq ft. The CSB would be equally effective in a basement where its compact dimensions could be an advantage, depending on the layout of the space. The Santa Fe Advance is a purpose designed unit for medium to large (up to 2,200 sq ft) crawl spaces. Customer reviews of this model are enthusiastic and favorable. We are pleased to recommend this product for any area up to 2,200 sq ft. The Advance can also be used in a basement of similar floor area and slots in between the Santa Fe Compact and the Santa Fe Classic in both water extraction capacity and price. The Santa Fe Compact is purpose designed for the medium sized (up to 1,600 sq ft) crawl space. Customer reviews are consistently positive and we can confidently recommend this product. This appliance is equally suitable for use in a basement of up to 1,600 sq ft and ideal for anyone for whom the Santa Fe Classic is more powerful than you need. The Santa Fe Max Dry Dual XT is the most powerful model in the Santa Fe range. For any one with a large crawl space, up to 3,600 sq ft, this is clearly the best unit available. It can also be used in a basement and for one this large there are few alternatives to this appliance. These appliances are free standing so installation as such is not an issue. It should always be placed as close to the centre of the space as possible in an "open" position for adequate air flow. As it is electrically powered the appliance, and the power cable should not be placed anywhere where they can come into direct contact with water. The continuous drainage facility will allow you to attach a hose to the unit and run this to a suitable drainage outlet. This may be difficult if the model you choose relies on gravity for drainage. Given the low height of some crawl spaces, raising the unit high enough to benefit from this may not be possible. In this case you may need to use a condensate pump run to a building drain to achieve continuous drainage. Some crawl space dehumidifiers come with a condensate pump kit as an optional extra although these tend to be among the more expensive models.